Pacific, Mo. 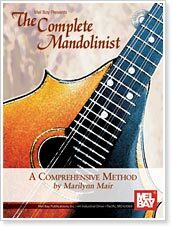 — Mel Bay Publications, Inc. announces a new mandolin method entitled The Complete Mandolinist, by Marilynn Mair. The publisher notes state this is the most comprehensive American mandolin method to be published in nearly a century. Starting with a foundation in basic technique and music reading, the book progresses in the course of its 224 pages through scales, arpeggios, tremolo, position work, shifting, rhythm studies, picking techniques and duo-style, with carefully selected exercises and musical examples that range from fiddle tunes and Brazilian choro to Vivaldi concertos and Beethoven sonatinas. Written by Marilyn Mair, internationally acclaimed mandolinist, recording artist and teacher for over two decades, this book presents a logical approach to mandolin technique that builds on the pioneering efforts of America's mandolin teachers of the early 20th century.